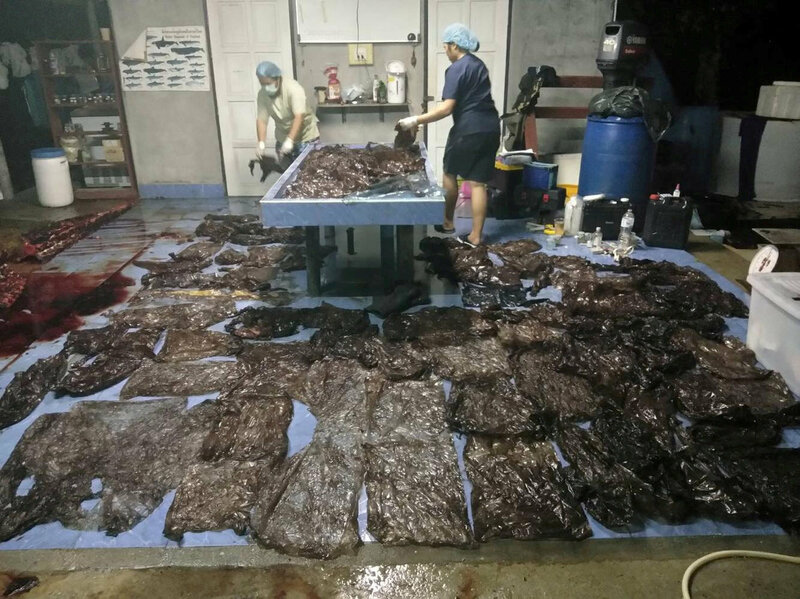 Our plastic is still killing whales – FIREPAW, Inc.
Around 80 sopping wet, black plastic bags lined the floor of an operating room in Thailand last week after they were pulled from the stomach of a whale found stranded on a beach. The pilot whale, which washed ashore in the southern province of Songkhla, later died after veterinarians tried for five days to save its life, according to the country’s Department of Marine and Coastal Resources. An autopsy found nearly 17 pounds of plastic inside the whale’s belly, a marine official told Reuters. The whale’s death and photos released by the department serve as a reminder of a growing global problem: plastic debris flowing into the ocean and killing wildlife. Scientists at the Thailand Department of Marine and Coastal Services told Reuters the plastic probably ended up in the whale’s stomach because he mistook it for food. According to a study in the journal Science Advances, of the nearly 8.3 billion metric tons of plastic produced since the 1950s, 6.3 billion has been thrown away. The heavy reliance of plastic is partially linked to the need for packaging products, which made up 54 percent of the plastic thrown out internationally in 2015. People have become too comfortable with single-use plastics that they don’t need. Experts are encouraging people to look at alternatives like canvas bags and glass, metal or paper straws.